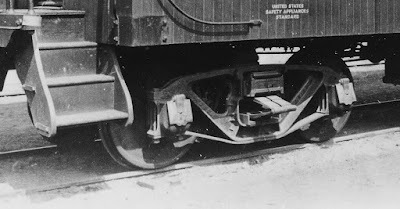 My first discussion of trucks and how they are sprung, included description of some ways in which snubbing by friction was introduced into freight car trucks (see it at: http://modelingthesp.blogspot.com/2016/04/trucks-truck-springs-and-snubbers.html ). The spring-substitute snubbers shown in that previous post were not the only early approach to adding some frictional energy absorption to trucks. Another method, recognized quite early, was to accomplish some of the springing with leaf springs (usually called elliptical springs, as opposed to helical or coil springs, based on their shape). 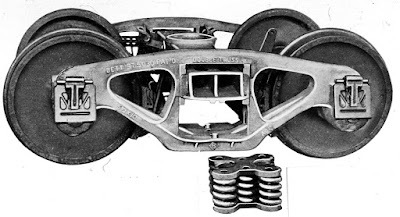 A leaf spring package is readily introduced into a truck sideframe, and in fact this had been done as early as the turn of the 20th century, for caboose trucks. 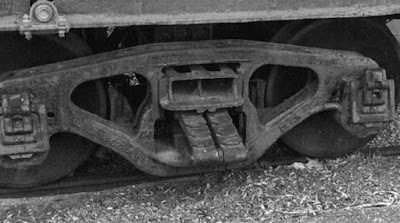 At the time, arch-bar trucks were superseding older caboose trucks derived from passenger designs, that had longer wheelbases and wooden truck beams. When compressed and released, an elliptical spring experiences relative motion between each adjoining leaf in the spring. That motion occurs with considerable friction, and thus accomplishes a kind of snubbing. A wide variety of caboose trucks (and sometimes freight car trucks) were built with leaf springs only. The Bob Karig photo below shows an example, in a Delaware & Lackawanna Western truck. This Gould truck with relatively modern double-truss cast-steel sideframes was produced in 1948. 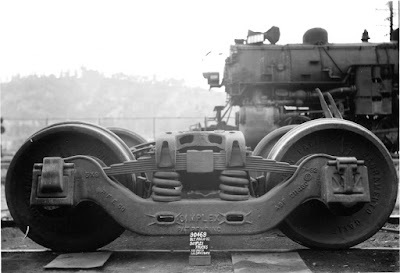 A 70-ton truck, usually with three spring pairs visible at the sideframe, could receive the elliptical spring set in the sideframe center, as seen below. Near the right end of the truck, the characters “6 x 11” are cast onto the frame, indicating 6 x 11-inch journals, the standard size for 70-ton nominal capacity. Note that you can see all the way through the hollow bolster. (You can click to enlarge.) Both this and the preceding photo are from the Richard Hendrickson collection. An even more ambitious attempt to incorporate a major role for elliptical springs in a freight truck was the Simplex truck of the mid 1930s. One is shown below. Among the buyers which tried out this truck (and kept it in service for a number of years) was Pacific Fruit Express, whose photo this is. Obviously both coil and leaf springs were cushioning the bolster here. This truck was never widely used. Reports were that although it did ride very smoothly and performed well at high speeds, it was significantly more expensive. But even as these kinds of elliptical spring snubbing systems were developed, along with the frictional-wedge kind described in the Part 1 post in this series, more compact and simpler ways to provide frictional snubbing were also being developed. I will return to those in a future post. I will also include here, for those interested in even more information about these matters, a couple of very complete and authoritative references on freight car trucks. Cyclopedia, Vol. 4, 2000, pp. 35–51. Hobbyist, May 2013 (download free from their site). There are adequate model versions available commercially of a couple of different truck designs with elliptical spring groups substituted for a helical spring pair. It is also quite possible to “truck bash” one for yourself, using one of the many express or passenger trucks with leaf springs: just cut off the leaf spring protrusion and and glue it in place over a coil on your coil-spring truck. But rather than discuss model trucks here, I would instead recommend the excellent illustrated description of HO scale trucks provided in Richard Hendrickson’s article, available at Google Drive from this link: http://modelingthesp.blogspot.com/2013/07/another-update-to-richard-hendricksons.html . I received an interesting challenge in an email a few months ago, and the idea has been rattling around in the back of my mind ever since. The writer said that it was all very well for me to describe projects with resin cars or extensive modifications to other kits, but how about if I were to take something really simple (he mentioned Accurail) and build it with some upgrades? That’s a blog post he would enjoy reading, he said. So I finally decided to shut up those rattling sounds in the back of my mind, and took a look at my stash of kits. 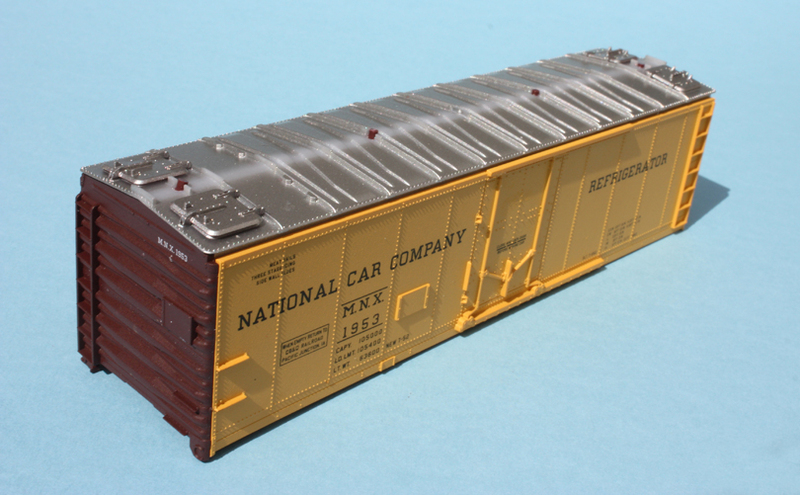 I had an Accurail kit for one of their steel refrigerator cars with a sliding (plug) door, which happens to have been decorated by 5th Avenue Car Shops for National Car Company. (You can see the 5th Ave. line at this link: http://www.accurail.com/accurail/art/custom/carshops/carshops.htm .) That sounded like a good prospect for this job. The box end is all the info I have about this decorated kit (the rest of the box lid is standard Accurail graphics). With any freight car, I start with the roof. 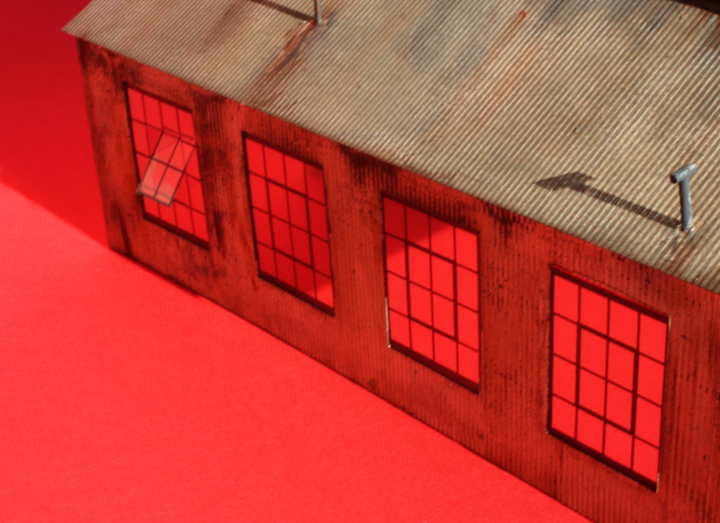 Most model layouts give us an overhead view of the freight cars, and mine is no exception, so the roof really needs to look good. The Accurail car has a molded styrene running board, not a terrible representation of a steel grid, but hardly in the appearance league of an etched metal board. Moreover, the roof has no corner grab irons, so I decided to add those too, using Tichy no. 3028 irons and Detail Associates eye bolts (part SY 2206). But omitting the kit running board leaves holes in the roof. I fill these with the attachment pins of the kit running board, seen here prior to touching up with silver paint. I also painted the roof corner grabs at this time, as they too have to be silver. The kit includes a full-length metal weight, which has just the right amount of weight, but can interfere with screws used to attach trucks or coupler boxes. (I greatly dislike the Accurail peg attachment for trucks, which seems to either be too frictional, restricting truck rotation, or gets loose and falls out. Either result is not okay.) But if I shorten the weight to clear bolster screw locations, I would eliminate some weight. Answer? Shorten it, then glue the removed part on top (I use canopy glue for this, excellent for dissimilar materials). You can see a little excess glue here, but it will of course be inside the car. Before going further, I should emphasize that although I am modifying or upgrading some aspects of this kit, its overall quality is really very high. Like almost all Accurail products, the parts are superbly engineered and go together beautifully. Some prototype details may be simplified or omitted, but the overall dimensions and appearance are excellent. My project here is go beyond that and improve the model even further. I mentioned the addition of corner grab irons on the roof. I also decided to add wire grab irons at the left of each car side. The molded-on side grab irons are easily removed with a chisel-blade hobby knife, and holes drilled for new parts (I use Westerfield grab irons, part no. 1198). They were touched up with Reefer Yellow. The etched-metal running board I used as a replacement for the kit part is from Plano (their no. 197), and the set also includes an etched metal brake step, which I also installed. Both these metal grid parts were attached with canopy glue. The photo above was provided by Fruit Growers Express expert Bill Welch, and shows the first car, MNX 1915, of 100 cars built in 1952 by Fruit Growers for their subsidiary, National Car Company, and numbered 1915–2014. These were, incidentally, meat cars, equipped with meat rails and classed as AAR RSM type. The photo above shows black door hardware, ladders and grab irons, but only this car was so painted, for the builder photo. Photos of cars built the previous year, and of other cars in the 1915–2014 group, show all this hardware as body color, which is how the model is decorated. Here’s a 1951 MNX photo that shows the yellow hardware, courtesy of Bill Welch. With detail parts installed or upgraded, I installed my standard couplers, Kadee “scale head” size, in this case the no. 158 whisker couplers, and Reboxx wheelsets with 0.088-inch-wide treads, in the Accurail truck frames. I have summarized my freight car standards in a previous post (you can see that post at: http://modelingthesp.blogspot.com/2011/03/model-freight-car-standards.html ). 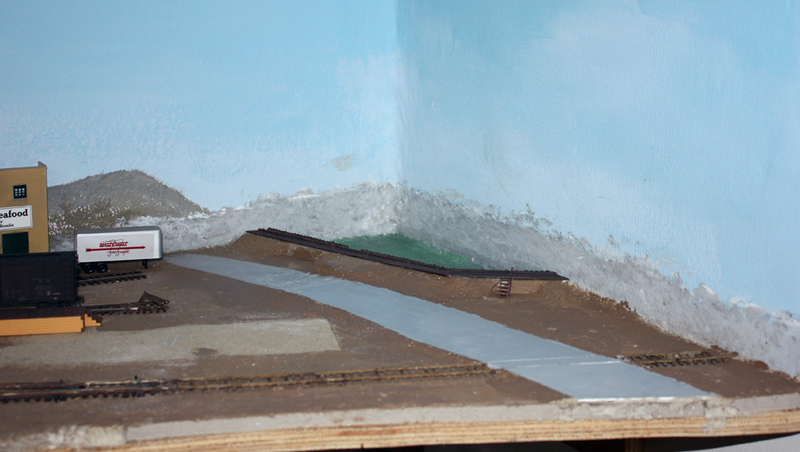 The completed car was lightly weathered (it would be only a year old in my modeling year), primarily in making the light-colored roof look grimy, and looked like the photo below. You can just see the replacement step under the door. This car will form an addition to my fleet of meat cars, which bring packing house products (PHP) to the wholesale grocer on my layout. I have chatted a number of times, over the years, with modelers who have little or no idea how freight car trucks are sprung, nor how the truck mechanism works. And without understanding springing, either spring snubbers or bolster snubbers make little sense. In this post I will try to clarify these matters a little. First, the springs. As modelers, we often think of freight car trucks of the 50-ton size as having two springs, which we can see from the outside of a prototype truck. And, after all, model trucks with “working” or “real” springs have just two springs. Here is a representative example of such a “real springs” model truck, which happens to be Kadee but looks like many others of the same type. To their credit, Kadee is steadily replacing trucks of the above design, with new, solid sideframes. But real truck springs are not like this. In fact, what looks like one spring nearly always consists of two springs, one inside the other. The photo below (from Union Spring) shows such a pair of springs; note that one is right-handed and one-left handed. There is no way one can see through such springs, as one can do with the model truck shown above. My late friend Richard Hendrickson experimented with putting a styrene piece behind the springs in “sprung” model trucks, so that you couldn’t see through them, but admitted it was a fussy job. It’s much easier to purchase solid sideframes in the first place. Moreover, one experimenter found that an HO scale freight car had to weigh half a pound before the springs in “sprung” trucks did anything, so they are not contributing to better tracking of any but the heaviest model freight cars. A further complication in prototype trucks is that a typical 50-ton truck has either four or five springs, not two, and moreover each of them is the kind of pair shown above. Since the 1920s, springs have often been assembled into “spring groups,” as they are called. 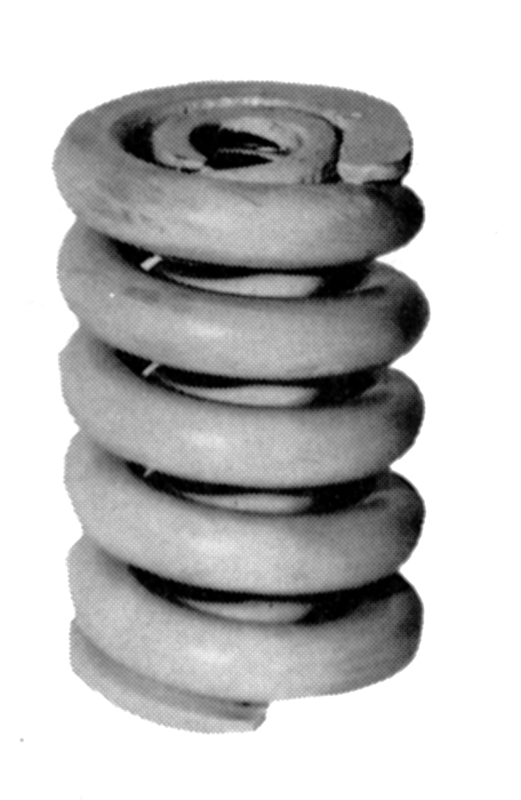 Here is a Cyclopedia photo clearly showing what a spring group looks like, assembled with spring plates top and bottom, and you can see a spring pair at each corner, and one in the center, five in all. You really can’t see through a group like this. 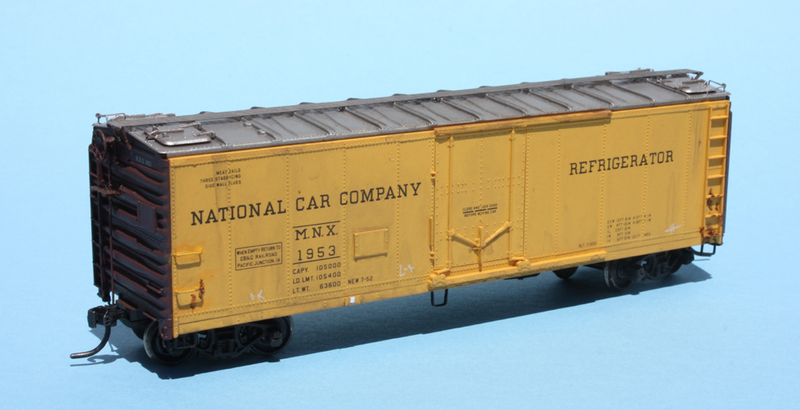 This happens to be a truck manufactured by Bettendorf, though as many modelers now know, that company ceased production of freight car trucks in 1942, and even when active, produced only a fraction of all freight car trucks. Thus using “Bettendorf” as a generic term for trucks with cast steel sideframes is broadly incorrect, and historically inaccurate after 1942. 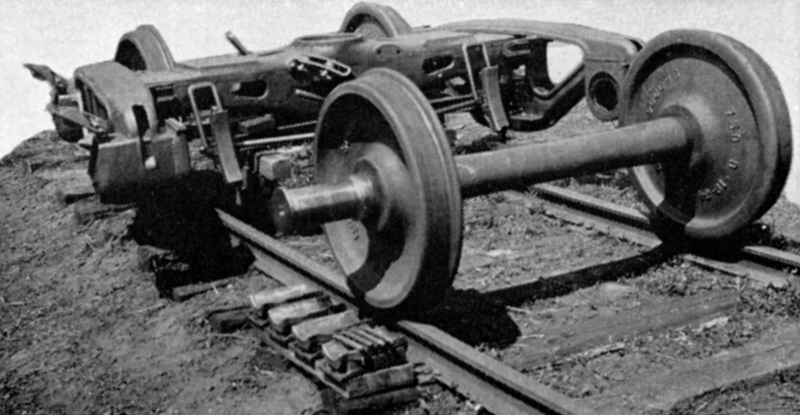 By the late 1920s, railroad mechanical people had become aware of the fact that the truck springs then in use gave a relatively hard ride. This was easily improved with longer and softer springs, but then the truck, and the car which rode on it, was prone to harmonic vertical oscillations at certain speeds, leading to severe “bounce” and possible damage to both lading and car. The problem is that a spring readily absorbs energy when compressed, but when the compression force is removed, equally readily releases that energy back in the opposite direction. This kind of problem with spring behavior had already been recognized and solved with draft gear, where the answer lay in adding mechanical elements which absorbed energy as friction, and then released much less or even none of it, when the original movement force was removed. The same was soon tried with truck springs, in a variety of designs, from practically every company that made truck parts. One easily understood example is the early Simplex design, shown below. Load application was vertical, and the inclined wedge surfaces were the frictional elements. A steel spring is in the center, and transverse springing is accomplished with rubber blocks at each side. 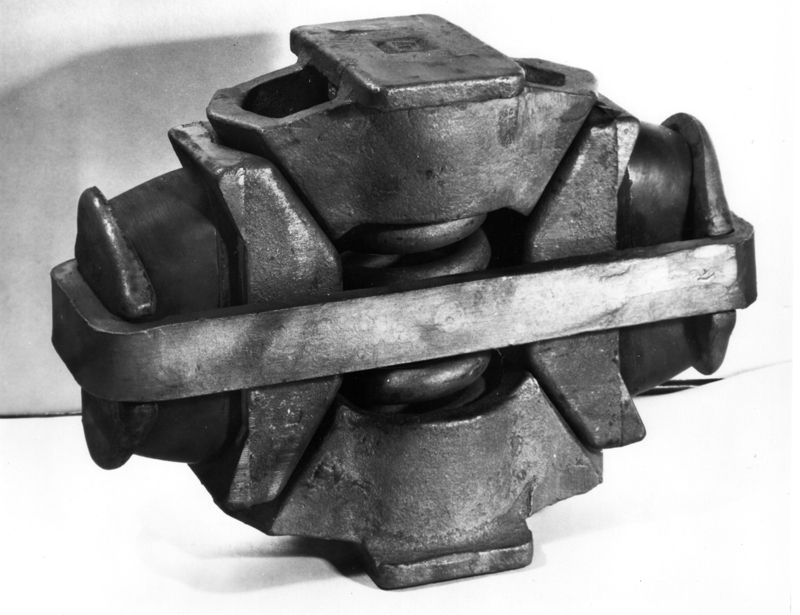 Below is shown one of these Simplex snubbers in place in a 40-ton truck (both photos from PFE). 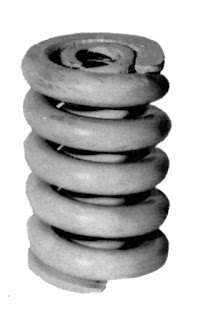 This general idea, to offer a snubber to the market which could simply be substituted for one truck spring in a spring group, was widely used. Here are two other examples of commercially available snubbers of this type (both photos from the manufacturers). At left is the Miner C-2-XB and at right is the American Steel Foundries (ASF) version of the Simplex design. Note that a snubber positioned in the center of a spring group, as the Miner is shown above, would be difficult to see in a prototype photo. But often the snubber replaced an outer spring. Shown below is the ASF snubber, installed in a Dalman-Andrews truck (Jack Burgess photo, Richard Hendrickson collection). For existing trucks, no other method of improving ride was so inexpensive and easy to install. To my knowledge, we don’t have, in any scale, a model truck with a snubber represented of the kinds shown here, though many thousands of them were sold and installed in the 1930s, and remained in service into the 1950s. But by 1940, a different solution was emerging, and after World War II, would dominate good-riding truck design. I will discuss it in a following post. In a previous post about my new shop track alongside the roundhouse at the town of Shumala on my layout, I mentioned the installation of a wheel track, as a radial track coming off the turntable. (You can read that post at the following link: http://modelingthesp.blogspot.com/2016/03/a-shop-track-for-shumala.html .) 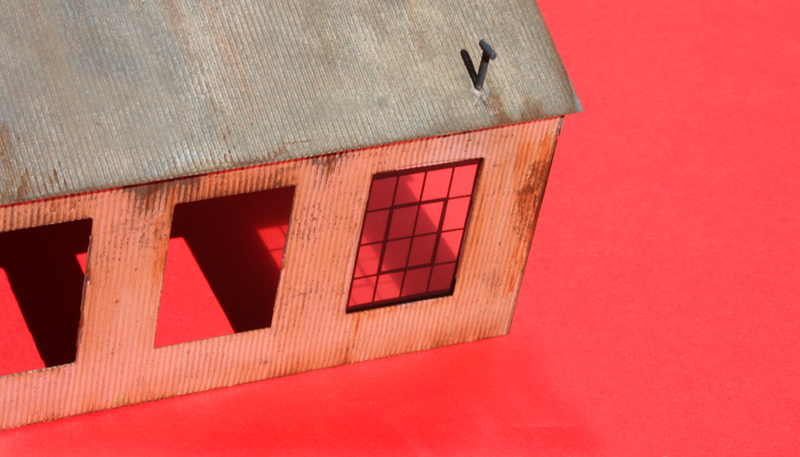 This present post is about modeling what goes there. I will begin with prototype wheelsets. 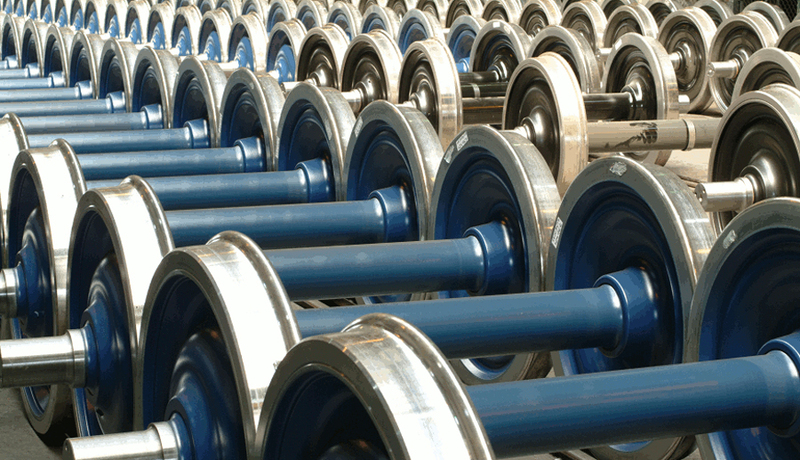 Many modelers seem not to realize that the end of a railroad axle is the surface on which bearings ride, and is called a “journal.” (This is why both roller bearings and solid bearings are properly termed “journal bearings,” because they ride on the axle journal.) 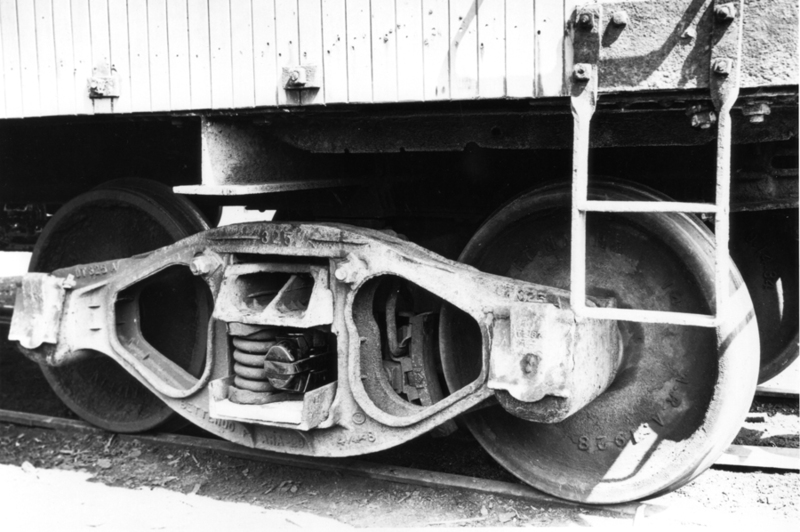 The photo below (from the National Malleable and Steel Castings Co.) shows a wheelset being removed from a truck, and the journal at the near end of the closest axle is evident. Prior to entering service, a newly mated pair of wheels and an axle are machined, to achieve exact journal dimensions. If necessary, the wheel tread may also be machined to correctly contour the tread and flange. Freshly completed wheelsets sometimes have axles or wheel faces painted, as in this contemporary view. 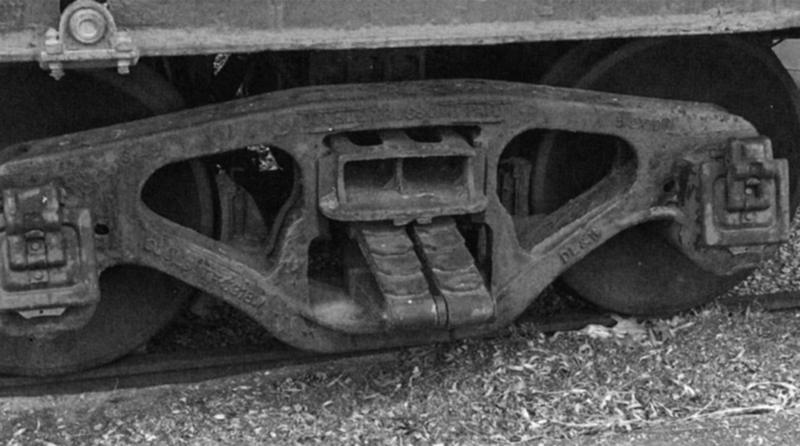 Also note that although the tapered center of the model axle here looks good, the prototype photos above all show an almost invisible taper for axles. Prototype drawings for axles, which show a rather gentle taper, can be seen in any volume of the Car Builders’s Cyclopedia over many years. 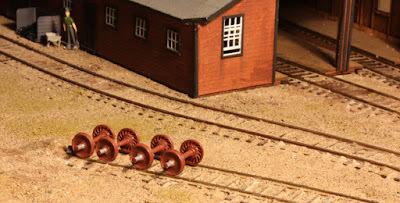 The foregoing photos should suffice to demonstrate why modelers should not employ most model wheelsets as scenery, because of the pointed ends on our model axles. Instead, there is an easy solution already available: the Tichy package of wheelsets used with their flat car (converted to a wheel car). The wheelsets alone are available from Tichy as set 3004, eight axles and eight pairs of wheels, which can be assembled or used separately as stored parts. Here is the same model wheelset shown above, with its pointed axle ends, alongside one of the Tichy wheelsets. Note the difference in axle taper, and in wheel tread width also. The “standard” model wheel tread in HO scale has had a width of 0.110 inches for many years, and that is the tread width of the pointy-ended wheelset shown above. What we now call “semi-scale” wheel treads are 0.088 inches wide. Prototype freight wheels have a rim thickness of 5-23/32 inches, which is 0.066 inches in HO scale. The Tichy wheels shown above are 0.066 inches wide, and though many modelers immediately say, upon seeing one, “it’s way too narrow,” in fact it is an accurate prototype wheel width. Another point about the photo of the Tichy wheelset is the journal. What’s critical for using these parts as models is that nearly all prototype wheelsets have a bright, metallic surface on the machined journal, with a rusty color on everything else. The Tichy set comes entirely in a good brownish-red color. I masked the axle centers and painted them Gloss Aluminum, Tamiya color TS-17, and then touched up the axle centers as well as the wheels with Burnt Siena and related acrylic colors to produce a realistic look. That’s what you see above. With these points in mind, I have made up several wheelsets for my wheel track at Shumala. I am not stopping there, because I want to show a truck being worked on, but for now, these Tichy wheelsets show the kind of look I think we need to model when we show these items as scenery. These wheelsets are not completed, because the color needs more work; this reddish color is the as-molded color as it comes from Tichy, but I want to get a browner shade on these wheelsets. Still, you can see the general appearance that will be created. Note that wheel treads are not shiny, indicating that these are new wheels, not yet in service. I will comment further about wheelsets and truck modeling in a future post. I am definitely among those who don’t find layout wiring to be their favorite part of the hobby. But it is, of course, utterly essential. So I cope with it, perhaps revealing my lack of enthusiasm in this series of posts entitled “electrical wars” (you can find the preceding posts in the series — and related posts — by using the search box to the right of this text, and entering "electrical wars" as your search term). A tool which I really created as a kind of obligation for completeness, but which has proven even more valuable that I ever imagined, is my Layout Notebook. 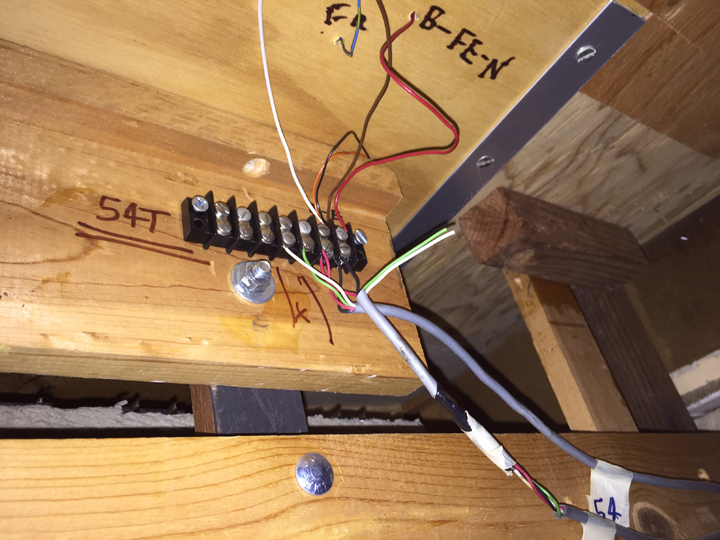 It includes benchwork basics, some scenery procedures, planning ideas, and even thoughts about structures, but the core of its usefulness is the electrical sections. I said a little about it in a prior post (which is at: http://modelingthesp.blogspot.com/2012/08/a-modeling-journal.html ), though that post was mostly about the successor Modeling Journal, for everything other than the layout wiring. The present post is occasioned by my cutover from plug-in DCC throttles, the previous arrangement, to radio throttles (as I described previously, in this post: http://modelingthesp.blogspot.com/2016/03/changing-throttle-connections.html ). Let me quickly say that the change from plug-in to radio throttles was, in and of itself, very quick and easy. The NCE technology works smoothly for this changeover. The only “electrical war” part of the project was re-examining all my layout feeders, to make sure I had two distinct and separate geographical districts in the new arrangement, specifically that all power connections to the outer end of my mythical SP branch line (the towns of Ballard and Santa Rosalia) were separated from those to the rest of the layout. You can see in this photo the feeder B-FE-N (it looks double, but the second image is the shadow of the wire), terminal strip 54T (so named because it is the “starting point” for Cable 54, which you see at lower right), and another cable connection, plus wires feeding other terminal strips. 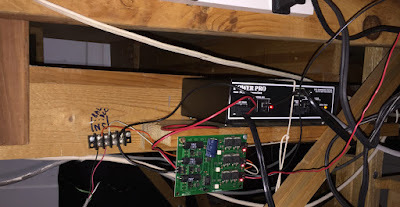 This was a good thing to see, because Cable 54 brings the DCC power from the command station to 54T and the cable below it, 53B, connects to all other Ballard feeders (the green and white wires in both cables are unused at this point). That meant that all Ballard and Santa Rosalia feeders were already separated from the rest of the layout, and could readily be connected as a separate district. Incidentally, I wanted to mention something I have been doing for some time, but it seems many haven’t thought of it. I use a headlamp when working on wiring under the layout. I had an old one from my backpacking days, and with fresh batteries, it was good to go. These devices, of course, are excellent at putting a beam of light right where you’re looking. I do use a conventional hanging “trouble light” also, but moving it around all the time can get inconvenient. Especially when just checking connections at terminal strips, as I was doing for the project described in this post, the headlamp was excellent. Once again, having a well-maintained Layout Notebook with up-to-date identity of electrical connections and cables proved invaluable. I’m glad to have this piece of electrical work behind me, and will definitely continue to make sure the electrical information in my Notebook is kept current. As I showed in a prior post about the trackwork in my layout town of Santa Rosalia, the end of my mythical SP branch line, the road which passes the depot is Willow Lake Road (see the location and the template for this road at this link: http://modelingthesp.blogspot.com/2016/03/the-branch-end-at-santa-rosalia.html ). 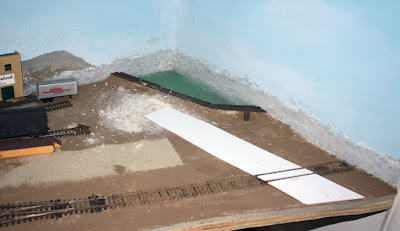 In the present post, I will show the construction of this road using styrene sheet, as I have done previously, and been happy with the result (see: http://modelingthesp.blogspot.com/2015/07/extending-bromela-road.html ). 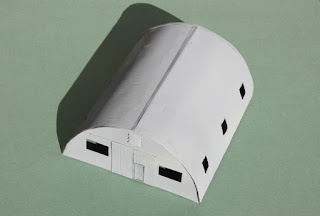 Some time back, I bought a large sheet of 1/16-inch thick styrene, and have been using it for a variety of projects calling for large pieces of material. That’s the material I used for Bromela Road (see link at the bottom of the previous paragraph) and is intended for this road project as well. Using the paper templates shown in the post linked near the top of this post, I cut the three pieces of styrene roadway, using a utility knife. Shown below are these pieces, so far just laid in place to check the fit. Just beyond the end of the styrene strip in the middle distance, you can see where I had to cut away some of the slope built up alongside the harbor edge, to clear the road. The unpainted rectangle to the left of the road is the footprint of the Santa Rosalia depot. I primed the styrene with ModelMaster gray primer, then “glued” it down with taxidermist’s paper mache (the Brandt’s Compound mentioned in a previous post: http://modelingthesp.blogspot.com/2012/11/the-shumala-extension.html ), while blending the sides of the roadway with the same paper mache.This is much like the process I used in extending Bromela Road in Ballard (I described the formation of road shoulders in the post cited earlier, at: http://modelingthesp.blogspot.com/2015/07/extending-bromela-road.html ). Once the glue-down function and blended roadsides had dried sufficiently (I usually try to leave it overnight), it looked like the photo below. A few rough spots have been sanded, but for the most part, whatever contours result from the application process will look all right. Once the paper mache was fully dry, I painted the shoulder areas with my usual “ground” color, Rust-Oleum Nutmeg, and then painted the road surface with Rust-Oleum Gray Primer. Though the road surface needs weathering and a little warmer color, which I will do with tube acrylics, the photo below shows the area after these additions of Rust-Oleum colors. The offshore fog bank still needs some refinement. Note above that the road painting does not extend quite to the backdrop. There will be strategic shrubbery placement in the completed scene, so that the road-backdrop intersection will not be visible. That intersection is also obscured by the depot, when it is in place, as you see below, from a more normal viewing elevation. A tractor-trailer is posed on the road. Pending weathering, installation of Willow Lake Road is complete. I also need to add the side street alongside the industries in Santa Rosalia, Laguna Street, but will wait until the industry spur and structures have been located before fitting that street into the scene. A complex topic in railroad freight traffic is that of diversions and reconsignments (which are almost the same thing, though the terms are sometimes used differently). I’m familiar with this topic in regard to perishables, and learned a great deal about it in my interviews with former PFE (Pacific Fruit Express) traffic people. I touched on this topic briefly in a previous post (at: http://modelingthesp.blogspot.com/2015/02/waybills-part-37-routing-of-loads.html ). In the present post, I want to say more about it, including some illustrations of how model waybills can reflect this aspect of traffic. First of all, a definition: “diversion” means change(s) in the ultimate destination of a load, while the load is underway in a railcar. Often the term “reconsignment” is simply used as a synonym for diversion, but if a distinction is made between the two terms, then “reconsignment” means a change in ultimate destination after a load has arrived at its original waybill destination. That distinction in turn would restrict “diversion” to only mean a change in the ultimate destination before the load arrives at the original destination. 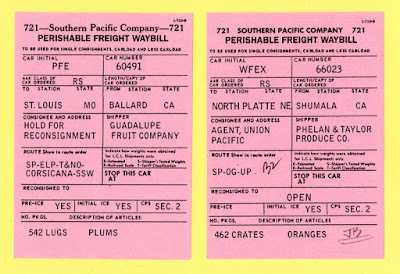 To illustrate, a load of oranges from southern California, starting its journey with a waybill destined to “UP agent, Kansas City” and thus clearly intended to be diverted, may be diverted by the shipper to Cleveland before the car gets to Kansas City. The Kansas City yard clerks will be ready to modify the incoming waybill to reflect a new consignee. But if the car arrives in Kansas City without further information, it would be held pending notification of final destination, and sometimes that process is called reconsignment. Note, incidentally, that if the load of oranges heading for Kansas City is diverted back westward, say to Denver, a new waybill would normally be created for a “new movement,” since if the car had originally been destined to Denver, it would not have gone to Kansas City from California. And if the car has to be held at Kansas City for more than a short time, the shipper will pay demurrage charges until the reconsignment happens. The format of these is slightly different. 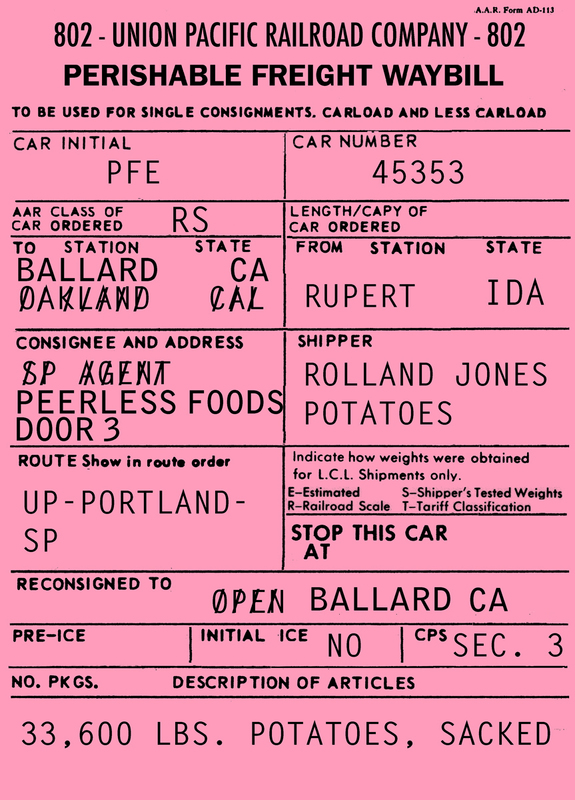 Note that the standard perishable waybill form, on which my model form is based, has a space for reconsignment (the prototype has multiple lines for this). 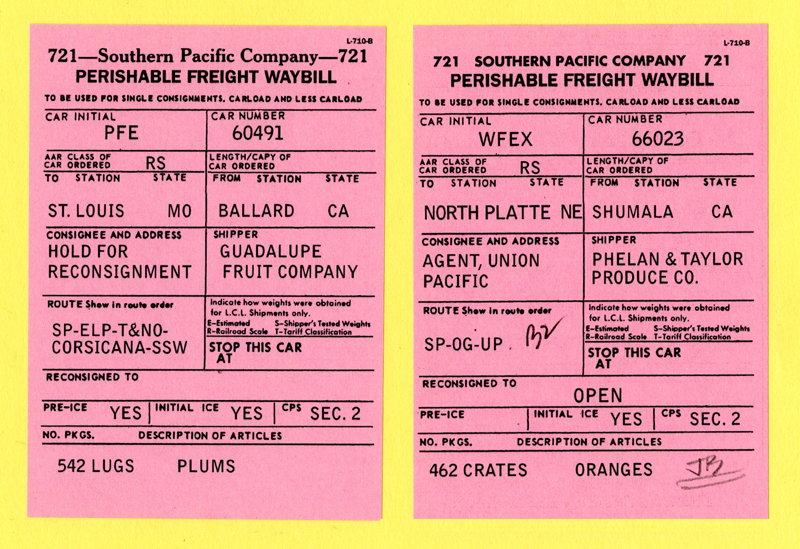 Pacific Fruit Express allowed shippers three diversions of a load without charge (there was a fee for diversions after the third). This covers originating loads which depart the shipper, intended to be diverted. 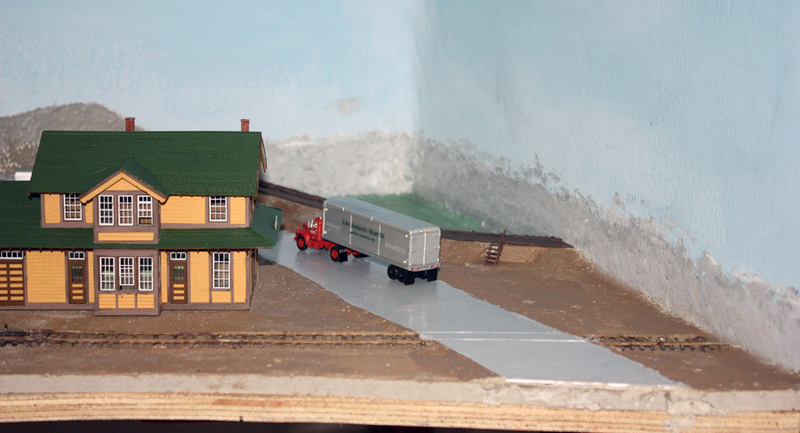 That is what can occur for loads leaving the packing houses on my layout. But I also have a wholesale grocer which receives inbound produce loads, and waybills for those loads could reflect an en-route diversion. 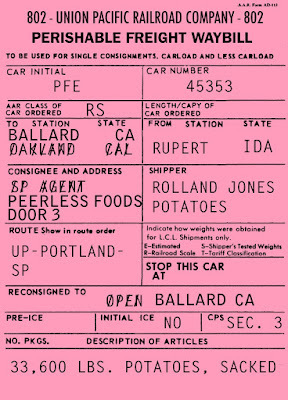 Here is an example, a load of potatoes from Idaho, originally destined to the SP agent at Oakland, California, and intended for eventual diversion. That agent received the diversion order, and when the car arrived, the waybill was altered by striking out the original destination information and adding the new information. The new information is in a different typeface, as would be expected. But there are other kinds of cargoes that may move with diversions during transit. This is certainly true for lumber, and lumber is different from produce in a very important way: it isn’t perishable. Thus lumber “roller” loads may be deliberately routed in a roundabout fashion to gain more time to find an optimum price. Perishables, by contrast, have to move as directly toward market as possible, and if diverted, diversions are chosen which minimize delay. Lumber traffic also differs in that it often involves intermediaries, usually brokers, during transit, even more than perishables. Lumber bills may well have similar appearances to the foregoing examples, as shown by the example below. This load was shipped with a broker as the intermediary, prior to diversion. Here the billing typewriters used by the two clerks have the same typeface, the SP standard face. Like many aspects of perishable shipping, I find diversions interesting. I don’t have scope in the operations on my layout to include too many waybills showing diversions, but I like to have a few. They are interesting, realistic and add variety. In the previous post, I showed the Tru-Scale kit for a Quonset hut structure and my beginnings of modification to it. 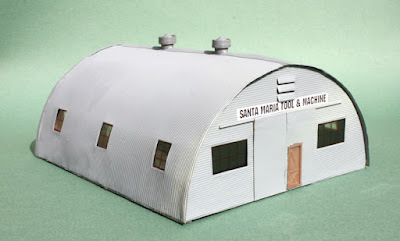 (You can read it at this link: http://modelingthesp.blogspot.com/2016/03/building-quonset-hut-machine-shop.html .) I have cut down the kit from its original 40 x 80 scale feet to a size that fits my layout space, 40 x 48 feet; the original Quonsets were essentially modular at the four-foot spacing of their ribs. 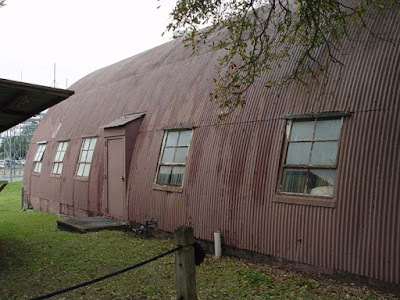 [For those interested in the history and design of the Quonset hut, especially its usage during World War II, I highly recommend a presentation by J. David Rogers (a professor at Missouri University of Science and Technology at Rolla), which can be found at: http://web.mst.edu/~rogersda/umrcourses/ge342/quonset_huts-revised.pdf ]. With all re-assembly and correction of damage to the cut-down Tru-Scale structure, and painted a medium gray (most Quonsets were painted), my model looked like this. Note I have cut a “man door” into the sliding door at this end, using a Grandt Line door. The next issue is windows. The original kit provided a strip of plain, clear plastic, with the advice to use a pen and ruler to draw mullions thereon. I wanted to do a little better than that. Incidentally, if the Photoshop file is in RGB mode, you can readily color the frames to suit the building in which you intend to install them. You can see that I made brown ones for this model. Once the windows were installed, I had to decide what to install for ventilators. The rooftop ventilators in the Tru-Scale kit did not appeal to me, as I found them a little odd in proportion. Instead, I dug into my parts stash and found a bag of Suydam ventilators, part no. S114, and used two of them. Here is a view of the completed structure. I printed out the simple sign on paper for each end.You can click to enlarge. This industry will need a loading dock for rail service also, but since that will have to be fitted to the exact track alignment alongside the building, it will be done later. It was fun figuring out how to use, and to modify, this classic HO scale kit, and I look forward to having this period-appropriate Quonset hut housing an industry on my layout. I mentioned at the time that I would like to extend the series, with suggestions about a more challenging problem, that of photographing model railroad layouts, but have only now gotten around to finishing that description. In the first of those earlier posts, I emphasized the three problems you have to learn to solve if you are going to make successful photographs of models: depth of field so everything is in focus, even though you are close to the subject; adequate light to keep exposure times reasonably short; and adequate support for the camera if exposure times are not short. The first problem is solved with small camera aperture, that is, large f-stop number; the third is usually solved with a tripod. For more discussion of these points, the first post cited above is the place to look. I emphasized in Part 3, in describing table-top photography, that a tripod or other secure support for the camera is often not needed, particularly if sunlight is available (sunlight is really a lot of light for a camera). But for layout photography, a tripod or equivalent is simply a necessity. You are indoors, so light levels can be a challenge, and that means longer exposures. The simplest layout situation is a photograph of a limited extent of the overall scene. It requires a tripod or comparable camera support, but a single light can work. In the photo below, I am using a 500-watt photoflood, handheld, for the photo I’m taking. The advantage of the handheld light is that it is easy to move around and optimize where shadows fall. 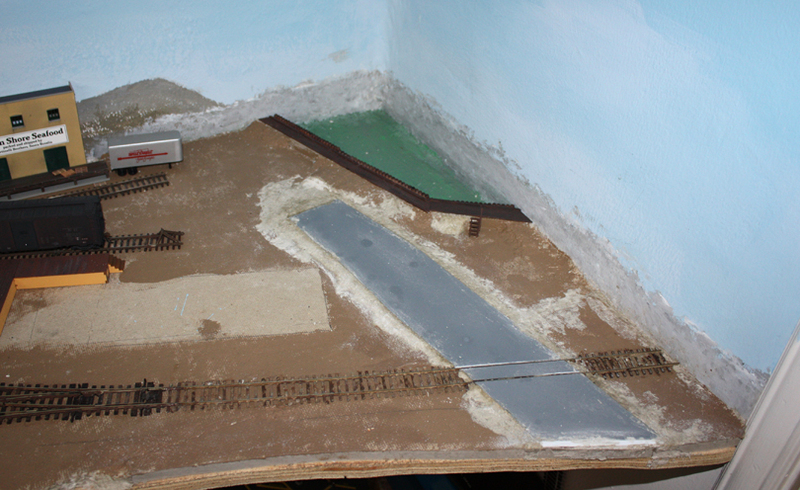 Many of my layout photos which show limited areas were taken just this way. Actually, a full-size SLR on this small Joby is a little unsteady, as you can guess from looking at it, but a small point-and-shoot camera can work well here. (There are also bigger Jobys.) I show this mainly to point out that there are alternatives to a standard tripod. But for many purposes, the tripod is your workhorse. 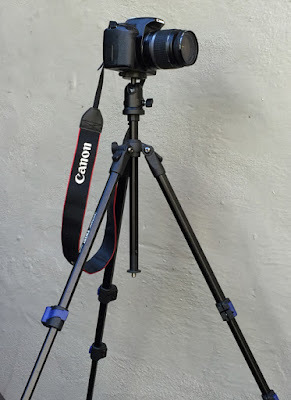 I’ve shown my old Davidson tripod in several photos, and here is my newer, more versatile and more capable tripod, a ProMaster “featherweight” FW20T. (See their line at: http://promaster.com/ ). 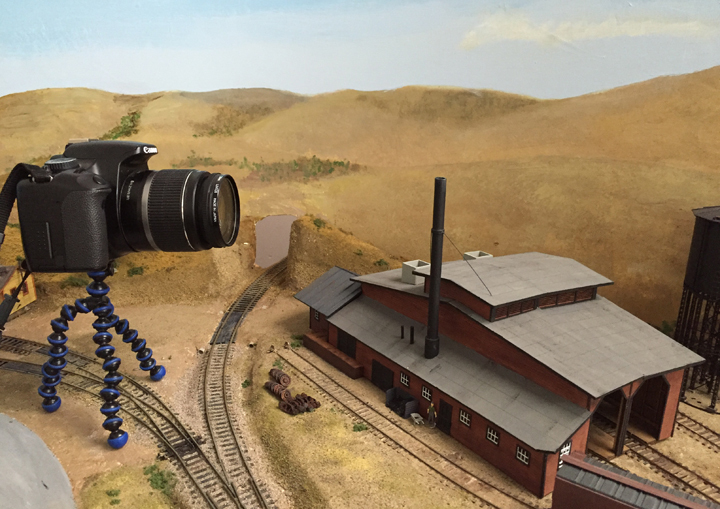 Both my tripods are useful in different ways and have their place. 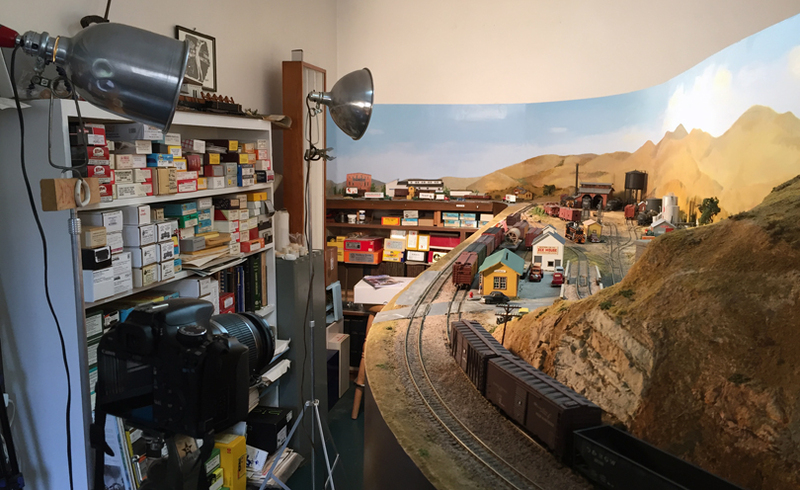 A more subtle problem is that you are often photographing an area of some size, compared to, say, an individual box car. This leads to the problem of light uniformity, that is, to get reasonably uniform light over the whole area to be photographed. This is a lot tougher than it may sound. Our human eyes have a remarkable range of light-level capability, and in addition, our brains are able to interpret these light levels to deliver a good image to our perception. Thus even with somewhat shaded or varying light levels, we normally perceive an “okay” light uniformity. But the camera, whether film or digital, does not see it that way. A few poor photo results are perhaps inevitable, but can be important training on this point. We have to learn to notice even modest difference in light level in the area we want to photograph, and take steps to correct those differences. To show a strong example of the problem, I have set up a shot along the length of my layout town of Shumala, about 13 feet long as I have set it up. No local or handheld light can possibly illuminate all this. 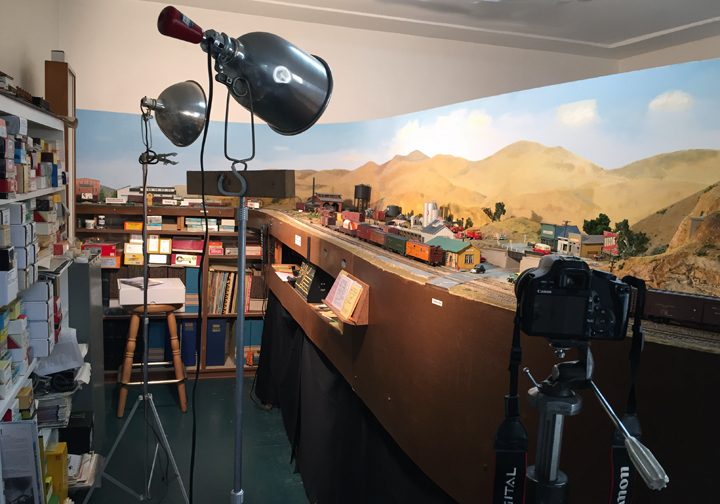 Instead, I use a big main light, ordinarily a 1000-watt flood, for the farthest-away segment, and a 500-watt fill to give best lighting at the near end, which the photo will emphasize. The photo below was taken from behind the tripod, and you can see the length challenge. To better recognize how well the main light and fill are illuminating the entire length of layout in this case, I stepped a little left to take the photo below, a bit off-angle from the planned shot, so you can see the light uniformity all the way down. Positioning of these lights is the result of experimenting with placement of each light. Both lights are on lightweight stands, all right for occasional use. These two photos, incidentally, were taken with my iPhone. In this post, I have offered several specific ways to approach the challenge of layout photography. These are just suggestions, and anyone not already familiar with these problems should plan on experimenting and, inevitably, making mistakes. It’s called learning by experience. At least today, with immediate digital images, one can move through the learning process faster than when a person had to wait a week or more to get back that box of slides. 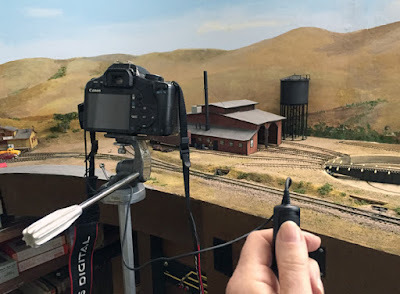 And speaking more generally, anyone with an interest in any of the kinds of model photography I’ve described in this series of posts should jump in with both feet and try it, if you haven’t already. And if you have tried it and were disappointed, I would suggest keeping at it. I have learned from myriad mistakes of my own, and I think anyone can do so. 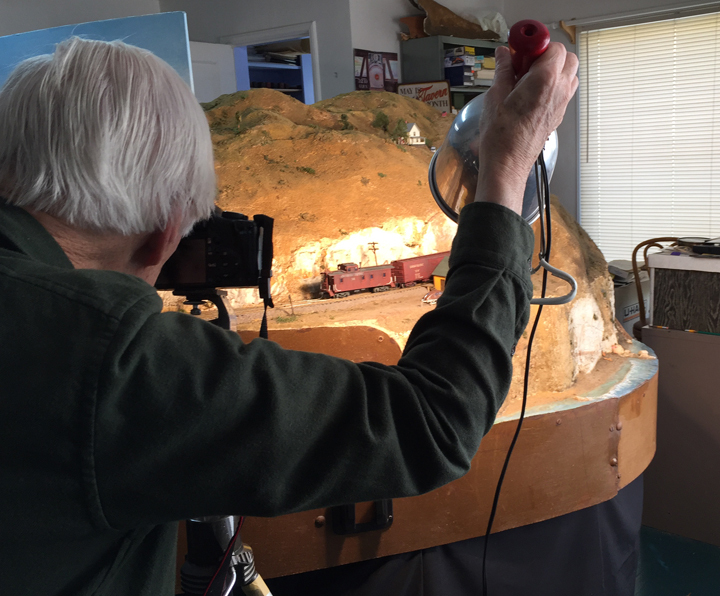 Today’s date being what it is, I can’t resist mentioning a previous post on this date, which recognized a short, timely article Richard Hendrickson and I wrote for Railroad Model Craftsman. If you’re interested, or don’t remember it, you can see it at: http://modelingthesp.blogspot.com/2015/04/getting-down-to-basics.html . 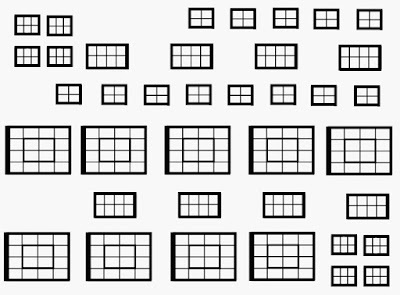 Turning to the topic of today’s title, I have often thought about the problem of making windows for structures which are to some extent in the background, that is, some ways back from the layout edge. These need not be excellent windows, as they will not be viewed at all closely by visitors or operating crews. 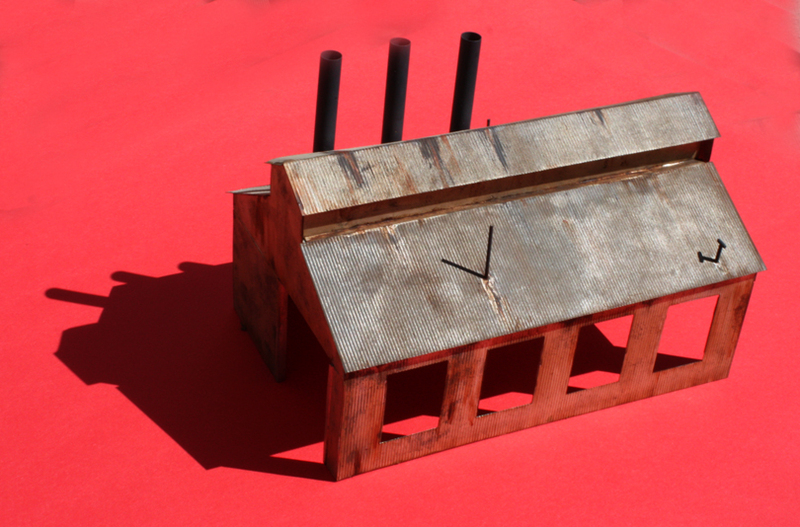 Among the structures which have a need for windows like this is the Receiving building at Jupiter Pump & Compressor (formerly part of the plant foundry), a Suydam kit which I showed in my first post about JP&C (at: http://modelingthesp.blogspot.com/2015/09/jupiter-pump-and-compressor.html ). Once weathered, the structure looked much better, but the lack of windows was rather glaring. My thinking process had led me to the conclusion that I could make windows in the following way. 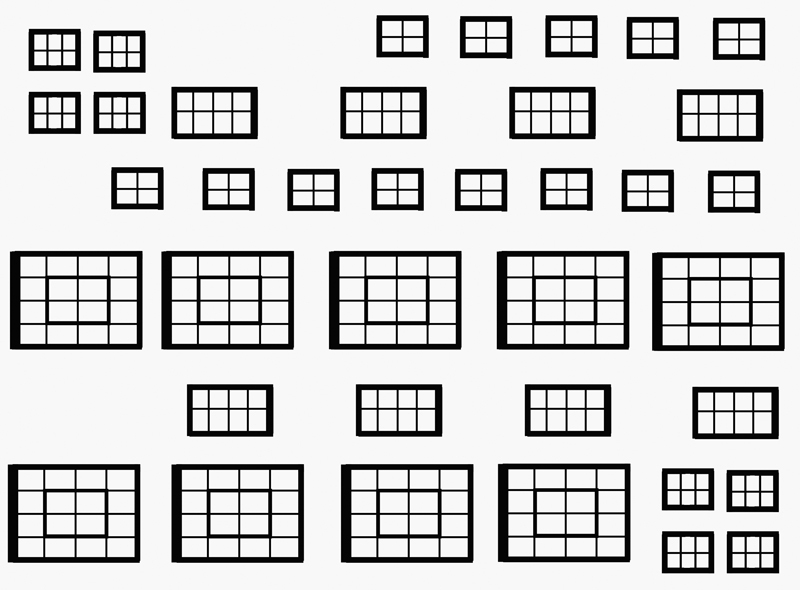 I used the Line Tool in Photoshop to draw window frames and mullions of varying widths, then duplicated each window so that the file would contain plenty of spares when printed. Once I was satisfied with the design, I printed out copies on overhead transparency sheets. Though overhead projector technology for lectures is at best obsolescent, many copy shops and stationery stores still have stocks of transparencies, and I had no trouble obtaining blank ones. 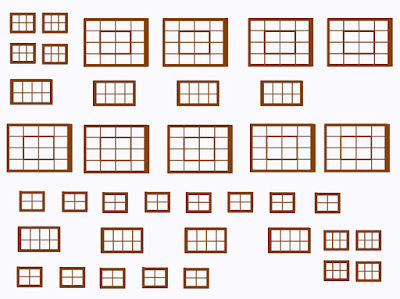 The image below shows how the sheet of windows looked (windows for other buildings are also included). These are intended to mimic industrial steel-framed windows, though they could work for other window types. I’m confident I am not the first person to think of this method, but I don’t specifically know of prior publication of it. (No doubt I will hear from those who do know of priors, no worries.) And there may be those in the younger generation who aren’t clear on what an overhead projector is, and if so, there is a clear Wikipedia entry describing it (see: https://en.wikipedia.org/wiki/Overhead_projector ). Incidentally, if the Photoshop file of your window drawings is in RGB mode, you can readily color the frames to suit the building in which you intend to install them. The ones for this model are black. I should also mention that the side of the transparency on which the copy machine has printed the toner leaves a slightly flat ink surface, so this avoids the frame being as glossy as the “glass” if you carefully install the printed side outward. Another nice appearance detail you can easily do with windows like these is to tilt the center portion away from the plane of the window, which is what many steel industrial windows like this were designed to do. I simply cut out the center section, then glued a thin wire (I used 0.010-inch diameter on this window) across the opening, then glued the cut-out center section to the wire, at the desired angle. The adjoining three windows are closed. I’m pleased with the ease of this technique, and feel that, at the layout distance of the structures on which I am using it, it presents no compromise with appearance. 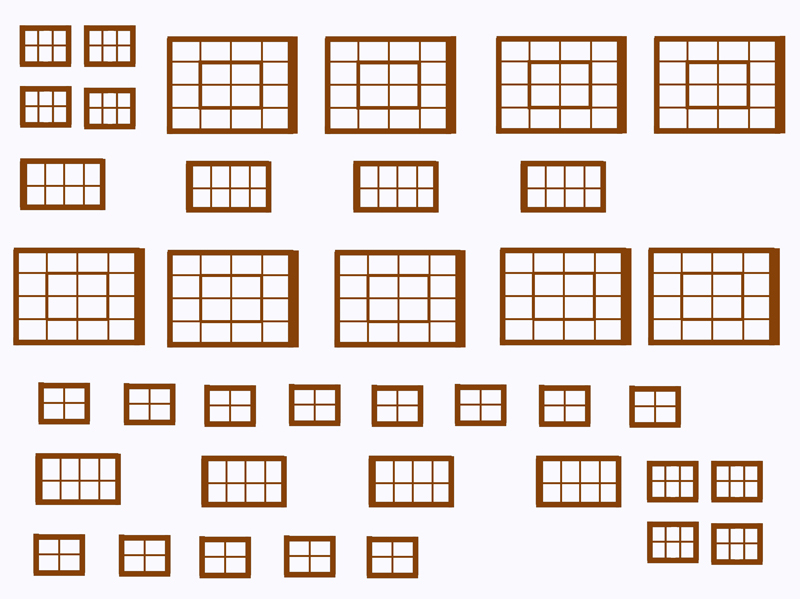 I recommend it if you have any background buildings which need windows, especially if they are industrial buildings.